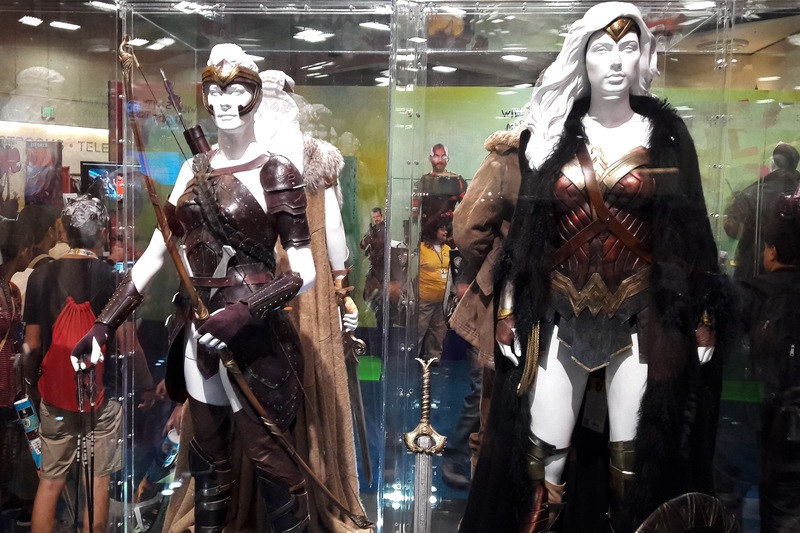 Take a closer look at the great San Diego Comic Con, and you will see more of its heart and soul within the booth displays. 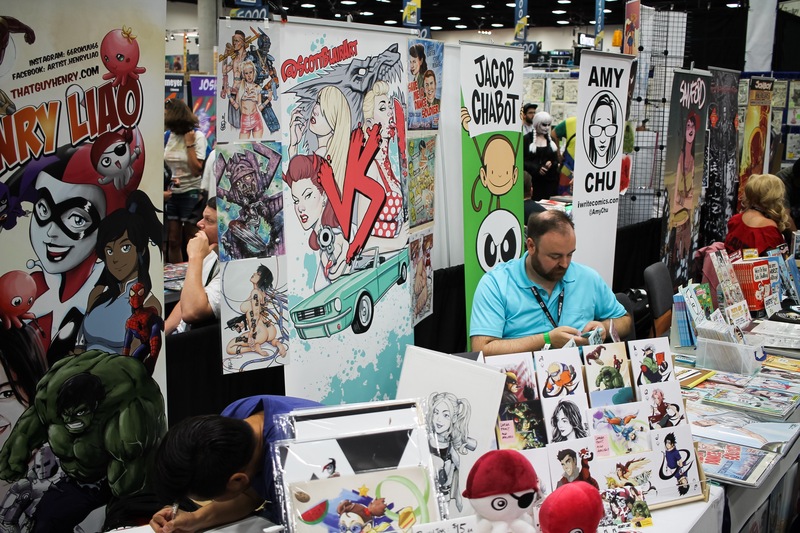 Within the Exhibit Hall, are the people and subjects that make such the event long worth going to, before the glam of celebs and pricy exclusives. 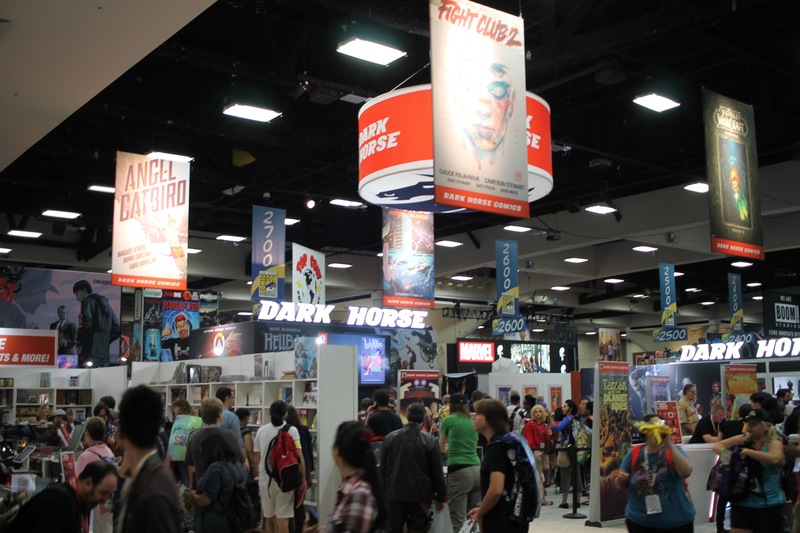 The Marvel Comics Booth, constantly crowded with heavy push for the Marvel Cinematic Universe movies. Aside from freebies, I didnt notice much of the monthly comics being promoted. I think there is another reboot of sorts called Marvel Now, which I have withheld my excitement for. The strength of Marvel Comics at retail racks has been with well-written books including Marvel Girl, Moon Girl, Vision, Totally Awesome Hulk. I wish it was more that, and not the movies. 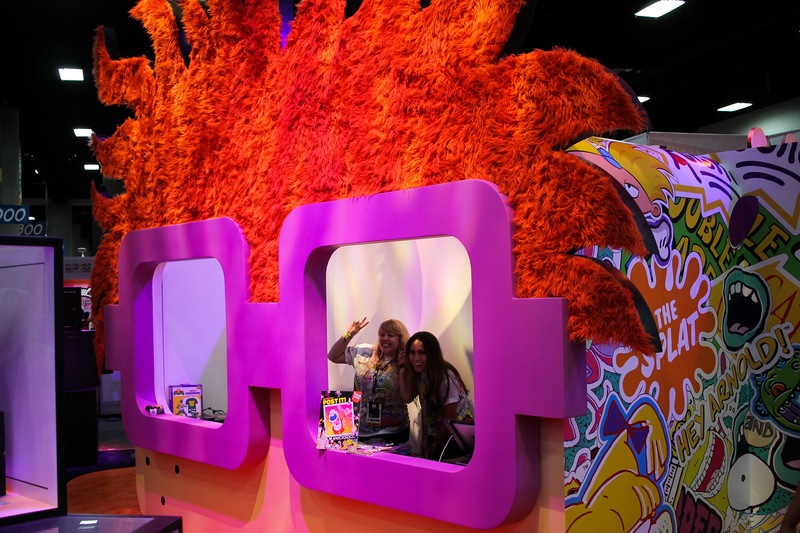 The Nickelodeon always puts much thought in their booth designs. This year showed expression, with throwbacks to the their golden 90’s era. 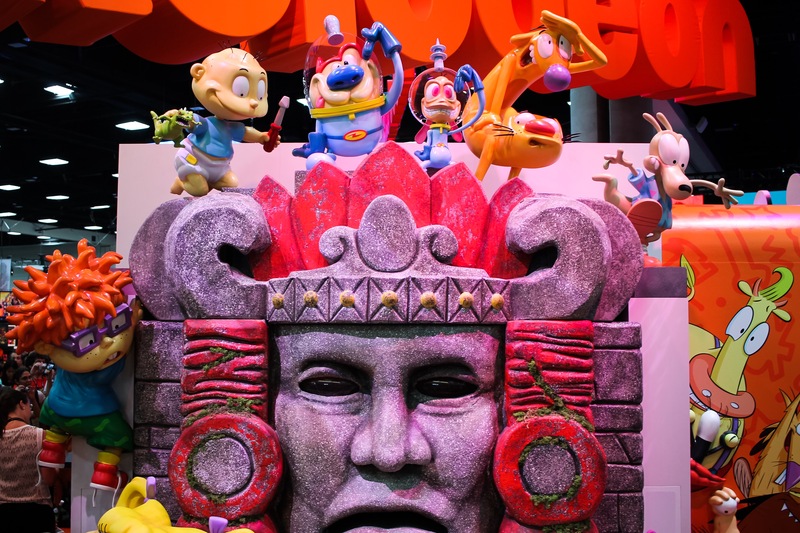 So much nostalgia, so much love…Legends of the Hidden Temple, Ren and Stmpy, Rocko, Rugrats never die! 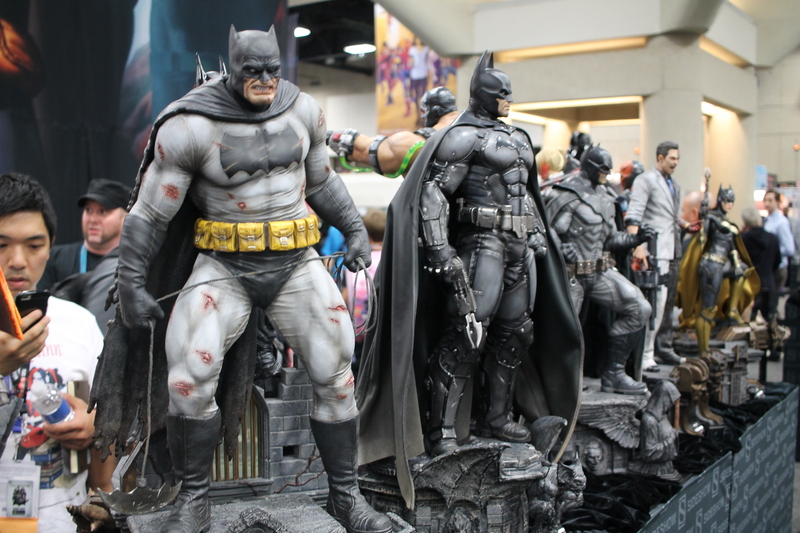 In the corner, vinyl and designer figures still make their impression on collectors. I see their stands rising in size, and exclusives for attendees to hunt down. Funko still being the most massive and ridiculous.. 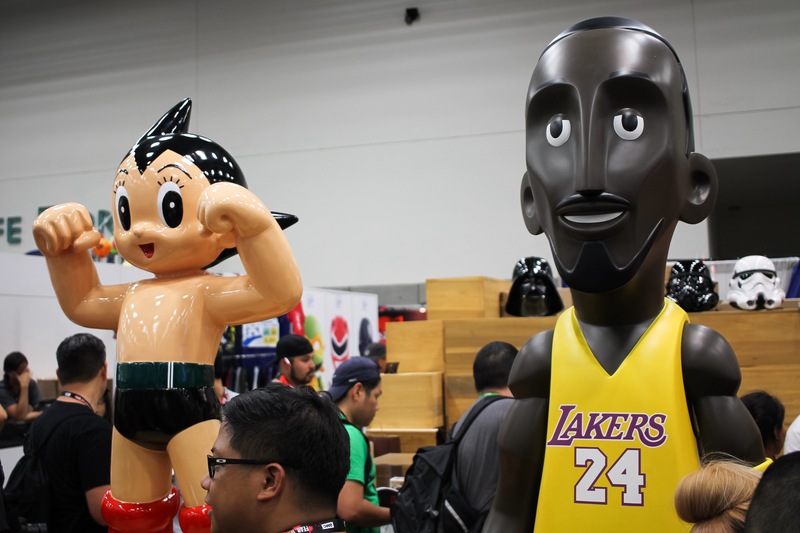 Here, I know not of the company, but love the giant Kobe and Astro Boy. 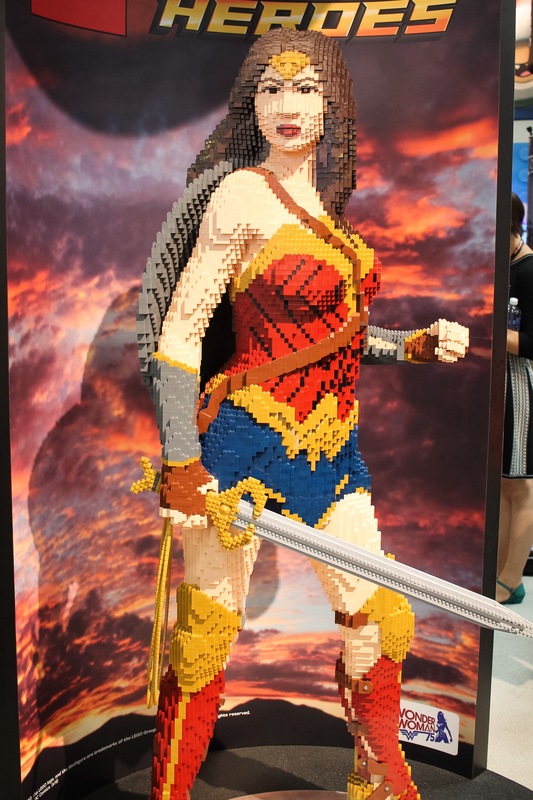 The Lego booth never disappoints with their display craft. 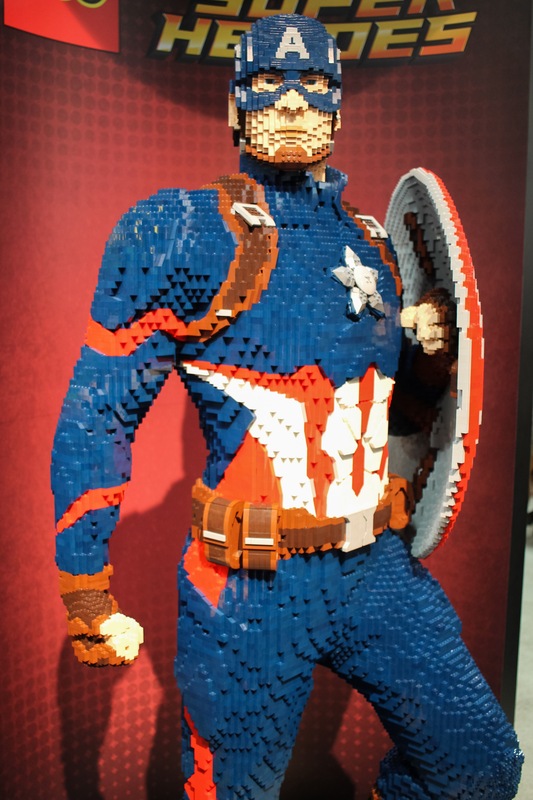 I wonder how many blocks it took for Captain America to make his stand here. 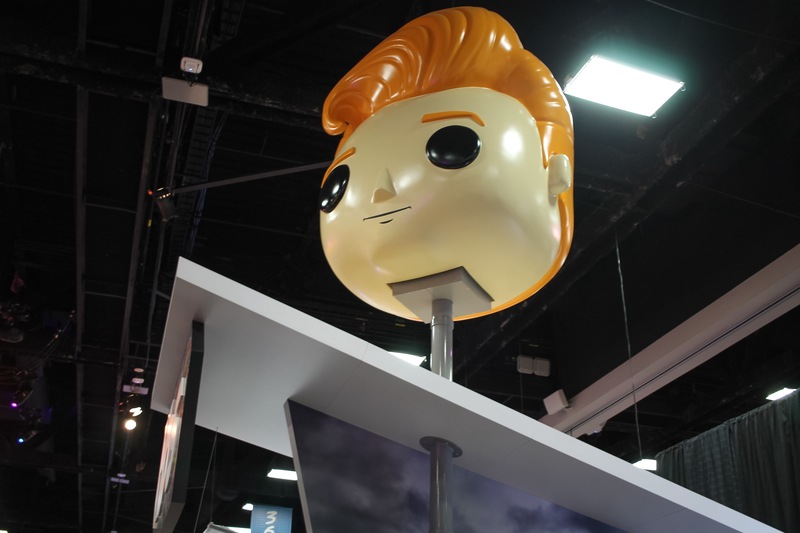 Meanwhile late night talk show host Conan O’Brien was quite the strange self promoting icon. I feel conflicted about this odd presence here at the con. 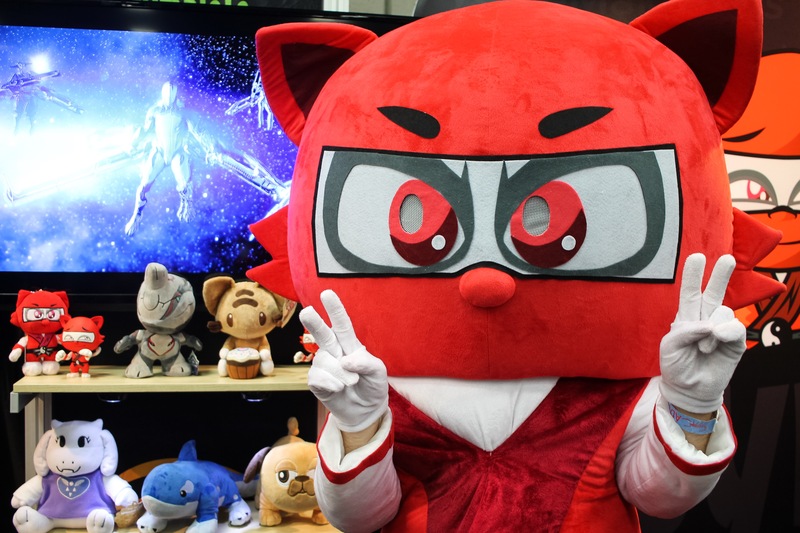 I think from watching, he could be one of us..but not so much as it’s just he’s becoming a pop-culture icon as well, complete with exclusive con collectibles also at the show. Booth signings are a bigger deal with year, with studios giving the fans a chance to meet entire casts, with the luck of a raffle hours before. 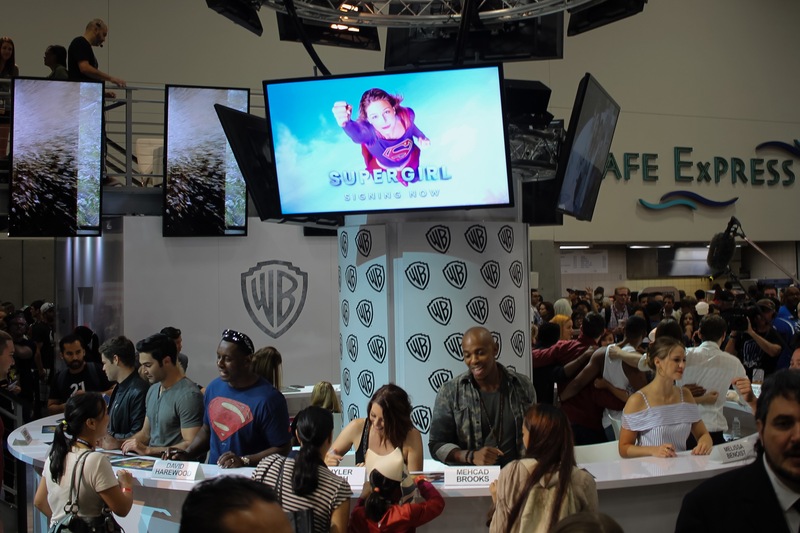 Here, the cast of Supergirl greets a long and very eager line. 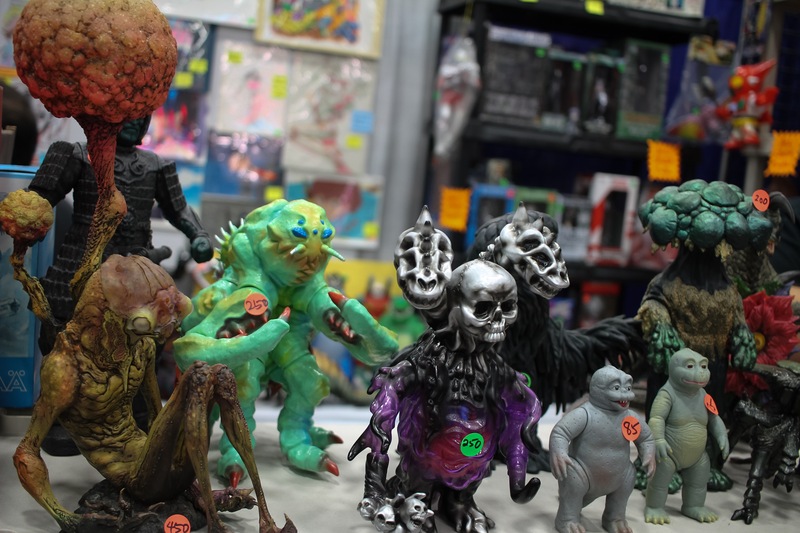 One booth shows off some rare and cool Japanese import figures. The Symbiote Studios stand I think is a newcomer to the designer figure corner of the Exhibit Hall, or at least new to me. Another booth, I did not get info on. 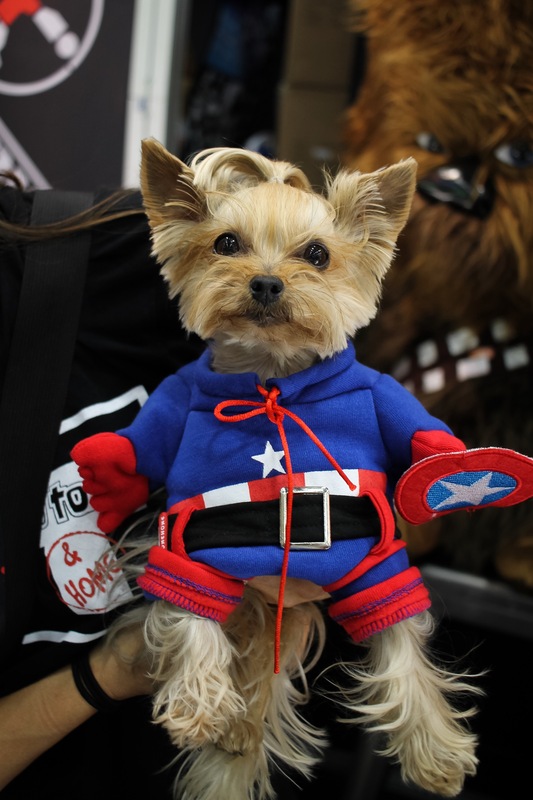 But they sell cosplay clothes for pets, I think.. 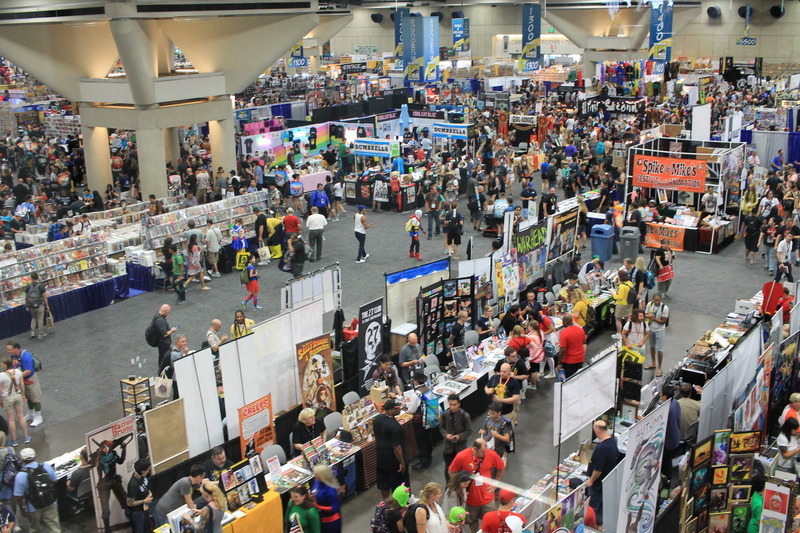 The typical awesomeness of the Artist Alley section, where the small booths are just as grand as the huge companies ones. Here you need no lottery ticket to meet the extraordinary people who also make a substantial impact on the fandom. 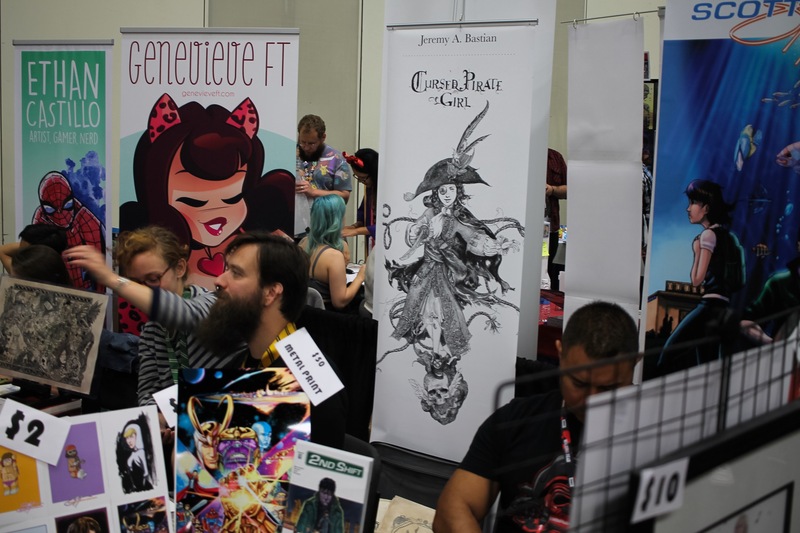 Of the Artist Alley and Small Press areas, some creatives have much fun and leave a memorable impression. 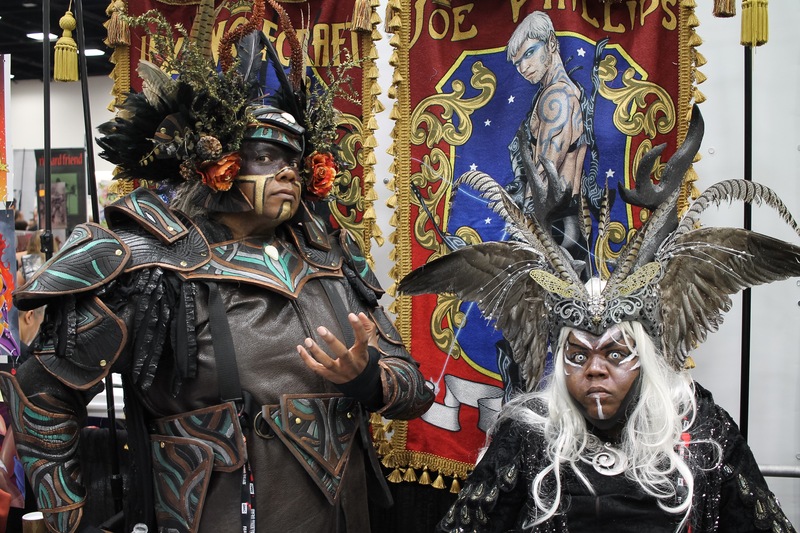 Here is artist Joe Phillips (I think on the left) promoting his new comic, a Midsummer’s Knight..a fantastical take on the Shakespeare classic. 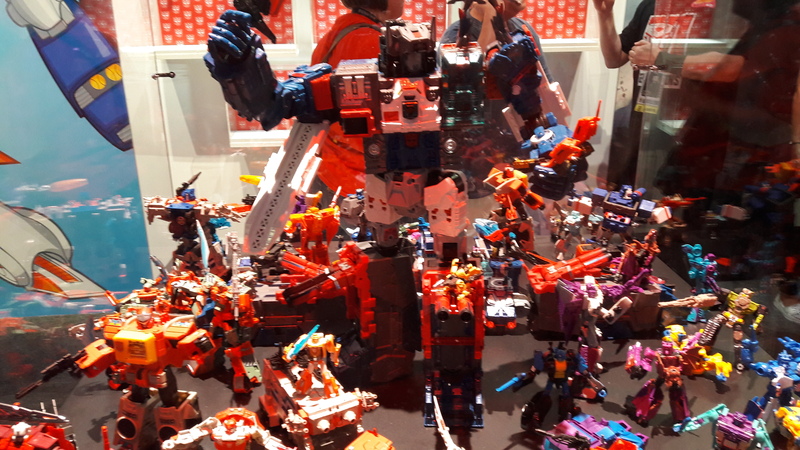 The Hasbro booth barely changes every year, but always nice to see the latest in new Transformers toys that appeal to my nostalgic soul, like the new Fortress Maximus on display. 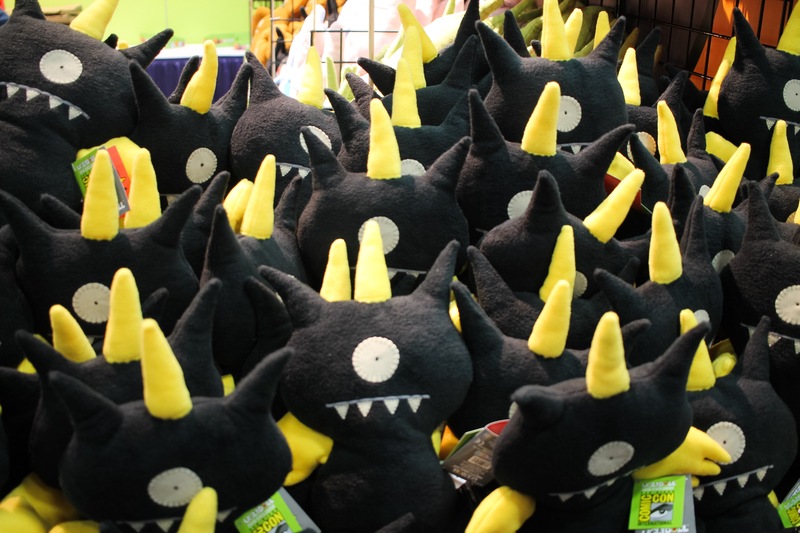 The Ugly Dolls booth cheers me again with its huggable plush monsters.. 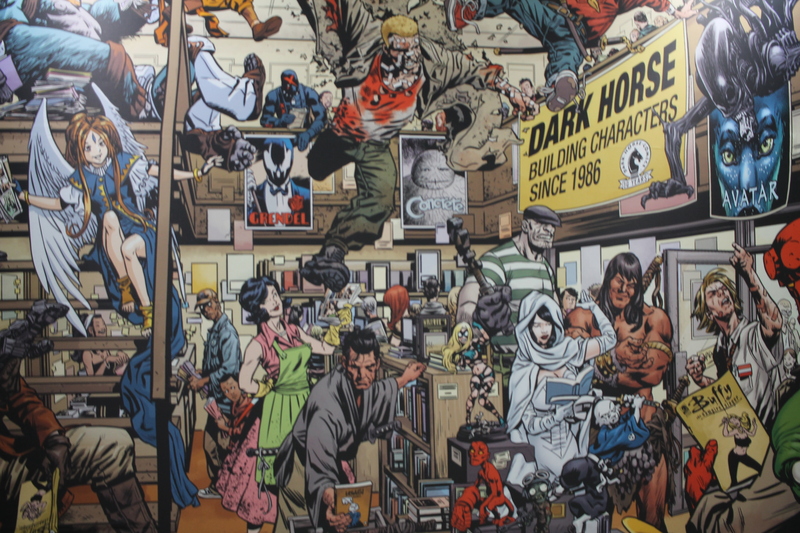 The Dark Horse booth stands proud and tall once again, with much on the new reads and the better array of guest artists and writer signings..
An overhead shot of the comics area, which with little emphasis on exclusives or swag, has a less claustrophobic crowd. That is until, Sunday where less panels happen and last-minute shopping kicks in.. 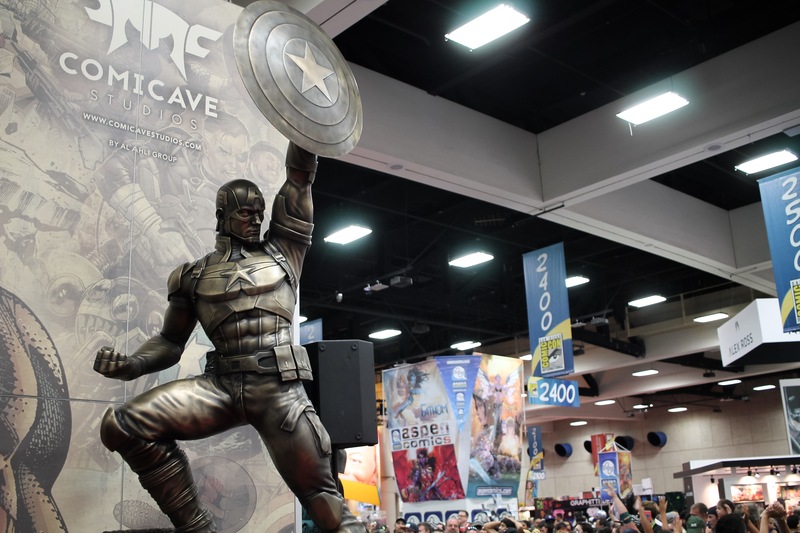 The Sideshow Collectibles booth, a constant at the SDCC for many years, where high-end figurines are showcased and presented for attendees to at least appreciate. 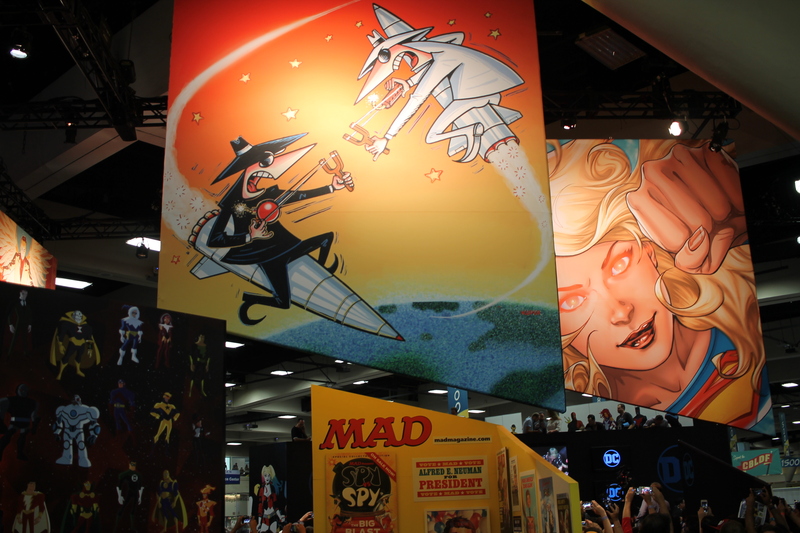 The DC Comics booth, which I love for still reminding all of its other awesome licenses, including Spy vs. Spy.. 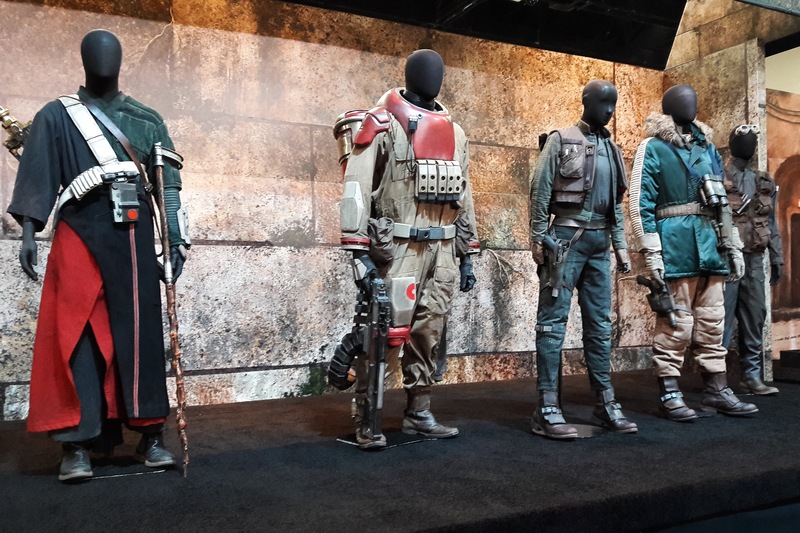 This year at he Star Wars booth, costumes from the upcoming Rogue One movie are on display..a definite treat for the fans attending. 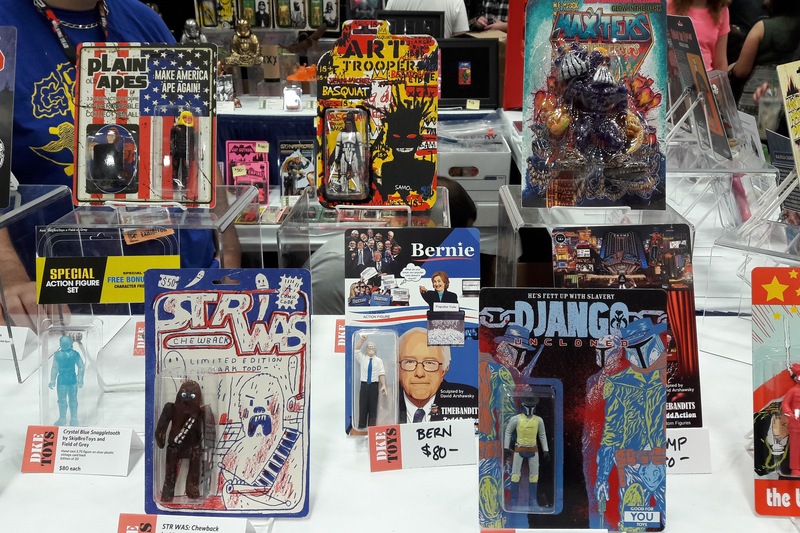 A favorite booth on recent years at the show, DKE toys; an awesome array of artist designed figures and packages. Many are on sale, at extremely limited quantities. 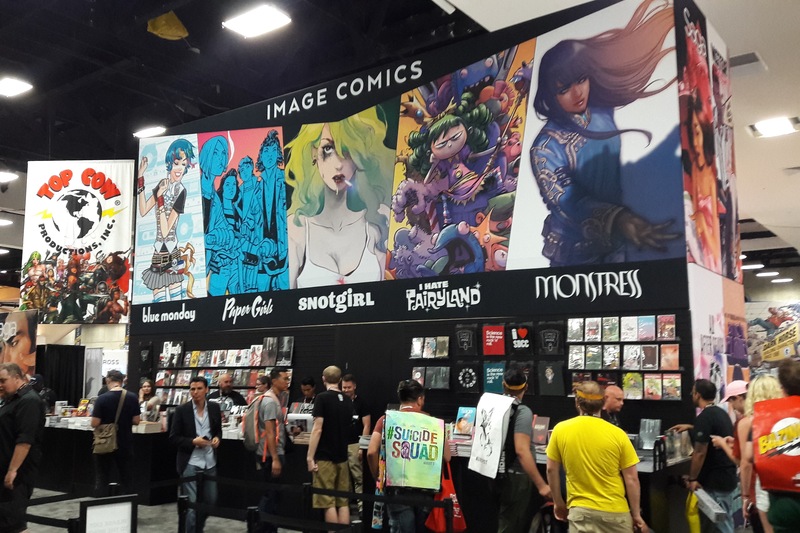 My current favorite comics publisher, Image Comics has the usual awesome booth. 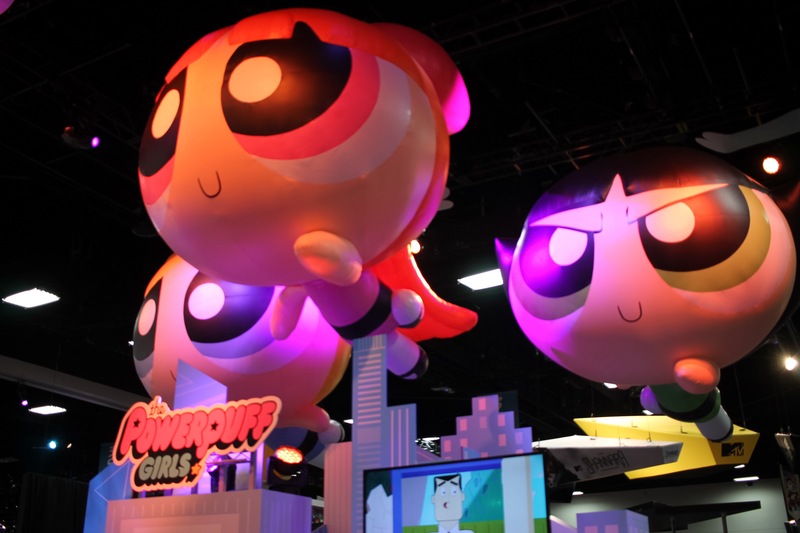 The Cartoon Network booth, featuring the return of the Power Puff Girls.. 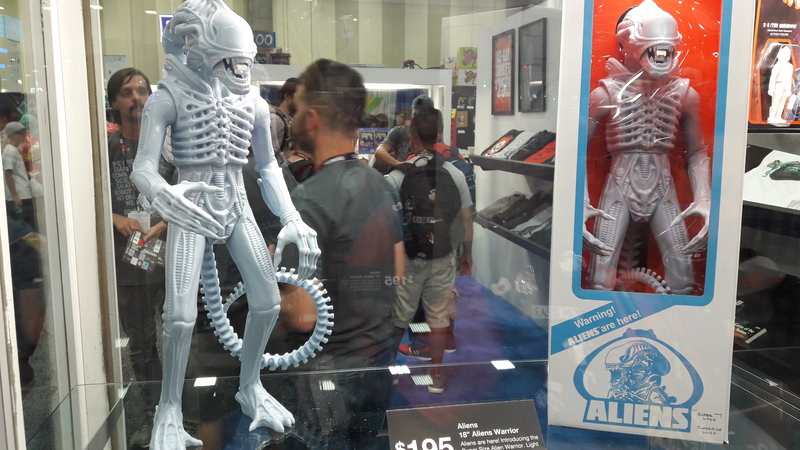 The Super 7 booth, featuring a reissue classics large Alien movie figure. 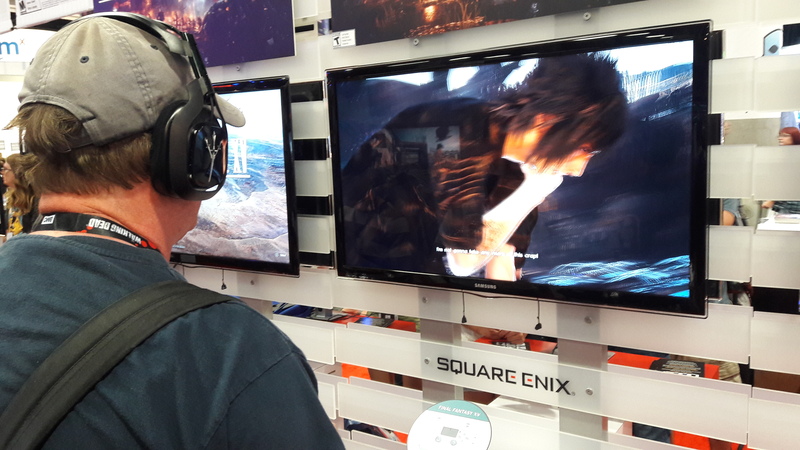 The Square Enix booth, though not as visually impressive from afar, got a much larger crowd coming in for a chance to play the upcoming Final Fantasy XV game, and get a very exclusive T-Shirt! 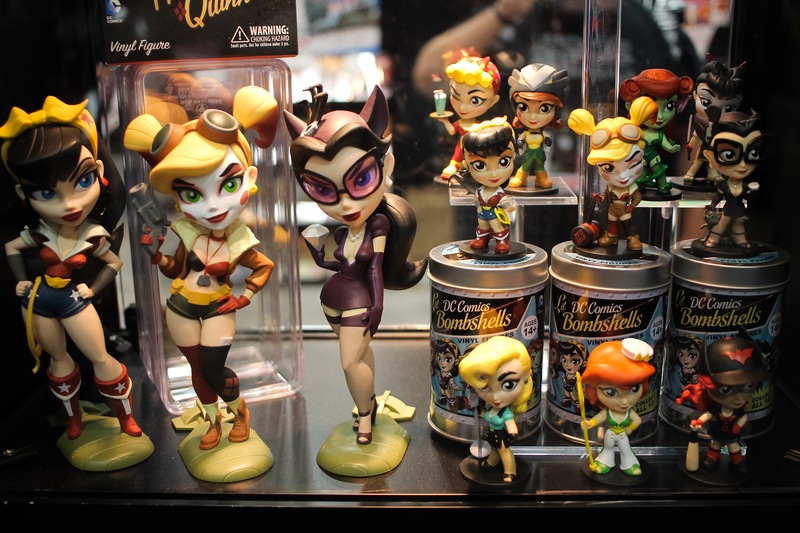 Many booths also showed upcoming products, like the DC Bombshells figurine line at the Diamond comics booth. More, on featured products in an upcoming post.. Sometimes, one good draw is all one needs to make a great impression. 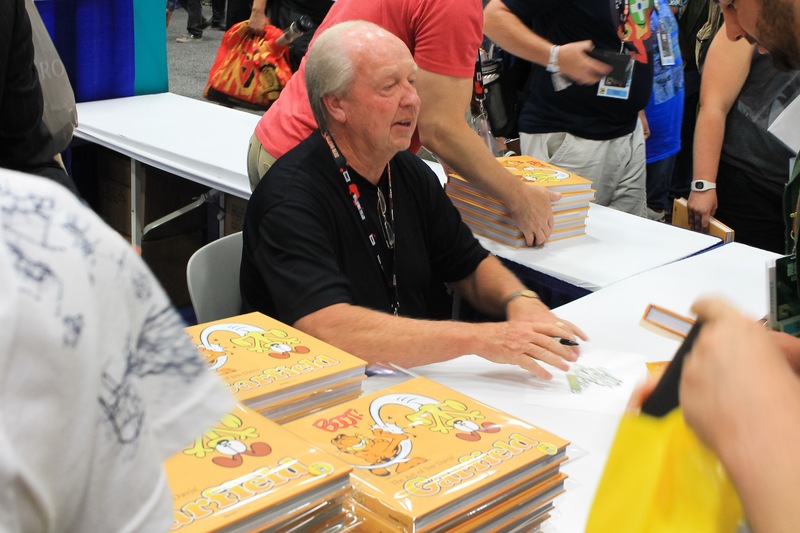 The Hermes publishing booth brought in Garfield creator, Jim Davis! That’s all for part 2, with my personal highlights of the Exhibit Room displays and presentations, with much thanks to the many involved. 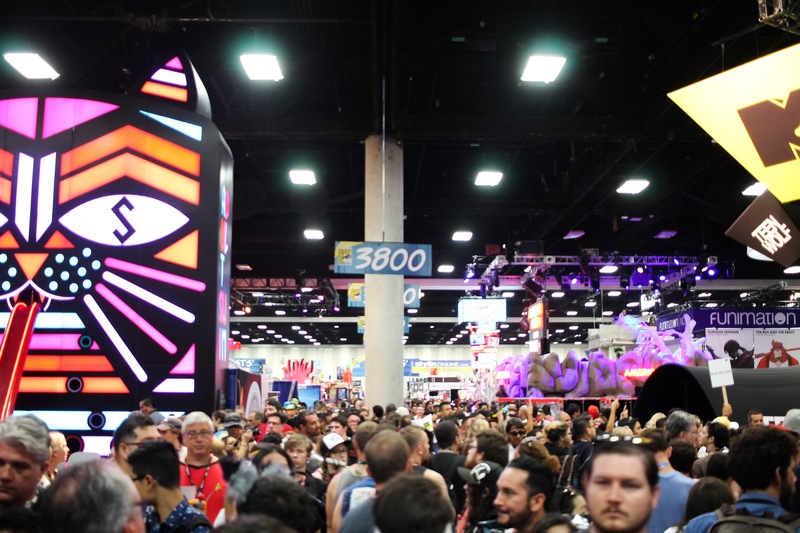 Come back to strangerworlds.com for part 3, with a zoomed look at the exciting people of Comic Con, with a focus on its creative talent.